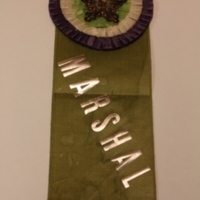 Photo of Ellen Spencer Mussey's marshal ribbon worn as she led the women’s legal group in the 1913 Woman Suffrage Procession. 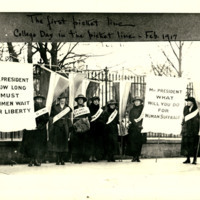 Photograph with label "The first picket line. College day in the picket line." 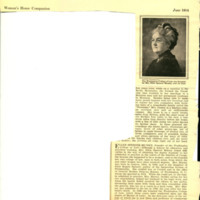 Brief biography of Ellen Spencer Mussey from "Woman's Home Companion." 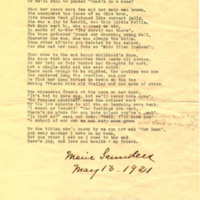 Longer poem written as a birthday tribute to Mussey. Notes her work ethic and values. 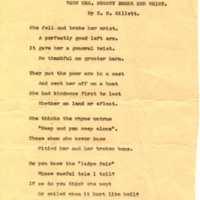 Brief and humorous poem about the time Mussey broke her arm, and more broadly about Mussey’s character and strength. 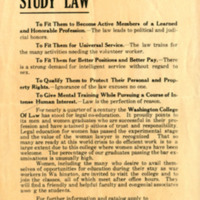 Flyer outlining reasons why women should study law. 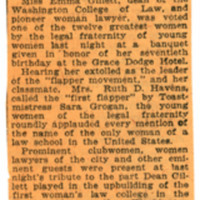 Language echoes reasons Gillett gave for why women should study the law in a 1922 interview with Grace Knoeller. 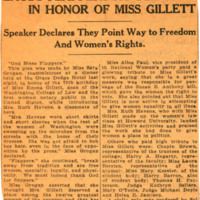 One of a handful of articles about Emma Gillette's 70th birthday dinner, notes how Gillett was seen by other prominent suffragists. 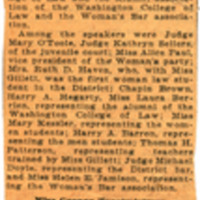 Clipping from the February 17, 1923 issue of the Washington Post. Summarizes a recent interview with Mussey regarding the Cable Act. 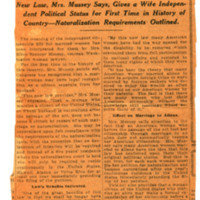 Law did away with naturalization at the altar and loss of American citizenship when women married foreign men.